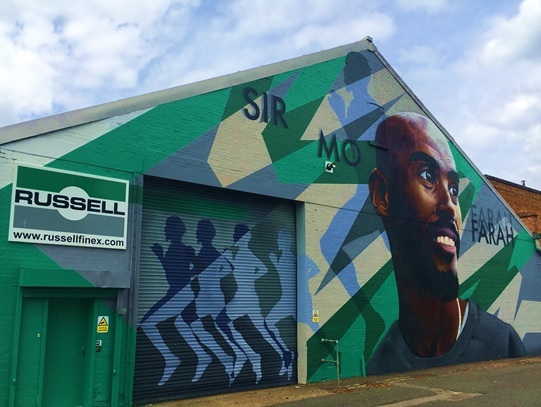 An exciting development has taken place throughout June 2017, as a local factory wall has been transformed to honour local hero Sir Mo Farah. Russell Finex, whose global head office and factory is based next to Feltham’s Leisure West, commissioned renowned mural artist Richard Wilson to create the giant painting, and ensure the iconic athlete is permanently commemorated in the town where he grew up. Sir Mo Farah attended Feltham Community College (now Springwest Academy), just around the corner from the factory, where his athletic skills were honed as a teenager. Since those early days, he has evolved into one of the most successful and recognisable athletes in the world, and the most decorated Olympic British track athlete of all time with four gold medals to his name. With his roots firmly set in the Hounslow, Twickenham and Feltham areas, Russell Finex is hoping that commemorating the athlete in this way can provide an iconic local landmark, connecting with the local community and, in turn, inspire the next generation of local sporting heroes. Moreover, with Farah competing in the IAAF World Championships in London throughout the summer, 2017 was the ideal time to honour him. The mural can be found on an area of Russell Finex’s wall on Mono Lane, next to Feltham Leisure West. Russell Finex, global manufacturer of industrial separation equipment, is committed to supporting the local community through fundraising events, business knowledge sharing and offers graduate programmes, apprenticeships and employment opportunities to the local area.